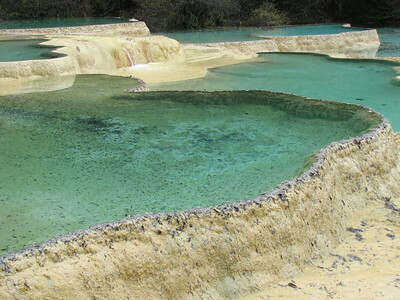 Huanglong has been acknowledged for its karst features such as travertine pools and limestone shoals. Calcite deposition has lead to the pools being rich in algae and minerals, which results in orange, yellow, blue and green coloured waters. The site is located in the North-West of China's Sichuan Province. At its inscription in 1992, it was recommended that Huanglong and nearby Jiuzhaigou (also in the Min Shan mountain range) would be inscribed as one site. Huanglong is way up in the mountains, at an altitude of over 3000 meters. I didn't feel too well this day, so I allowed myself cutting some corners visiting this WHS. I took the cable car up (another WHS with a cable car! ), and walked straight down from there. This takes about two hours and on the way you pass most of the pools and waterfalls. Every 500 meters there's a toilet (comforting in my condition of the day) and about every kilometre or so there is a hut where oxygen is supplied for free. Many of the Chinese visitors were carrying their own oxygen cans also, but the altitude didn't bother me (after already having visited Tibet). This site feels more crowded than Jiuzhaigou because everybody has to walk the same trail and there are no buses to skip parts. The total area also is much smaller. Although less similar sites have been put together to one WHS, I can see these two having been put forward as different sites. Jiuzhaigou is a large park with many features like the US national parks, while Huanglong is specialized in the geological phenomenon of travertine pools. I did enjoy its particular scenery (indeed much better than Pamukkale, as the IUCN report says) and feel that it is certainly worth a daytrip for anybody. Like Jiuzhaigou, the entrance area of Huanglong has a visitor center, some restaurants and shops. Bring warm clothes as it gets cold up here. Getting there and away as an individual visitor is tricky. One bus a day is reportedly driving between Jiuzhaigou and Huanglong, but at neither sites I did see any sign of this. So I went by taxi, a very scenic drive of 2 hours. I asked around at Huanglong for "the bus to Jiuzhaigou" - which seems quite a stupid question as about 200 buses were parked there and most of them going to Jiuzhaigou. But they all belonged to tour groups. At parking lot #4 I found some taxi's waiting, one of them wanted to drive me back. You'll have to change taxi about half way as the various taxi firms seem to stick to their own area. The drivers organize this among themselves. This beautiful site is a must if you visit Jiuzhaigou, a more famous site nearby in the Himalaya foothills in Sichuan Province, China. It is quite a climb, from about 3,000 meters at the entrance to 4,000 meters at the top, the length is about 3-4km, so it is quite steep. You would go up along the river "Yellow Dragon" or Huang Long, to view the waterfalls and mineral deposit pools (all in yellow). All paths are set in stone steps, as the management has taken all the natural hazards out, and porters can be hired to carry you up in a sedan chair. Although this is frowned upon. Oxygen canisters are available at the entrance, I didn't need it, but used it anyway when I reached the top. The companion site to Jiuzhaigou in western China is less crowded, smaller and has only one trail, going from about 3,000 meters to 4,000 meters in elevation and covering about 7km each way. So for those less fit, oxygen cannisters are recommended to relieve headaches from oxygen deprivation, or one can be heartless and hire a sedan and be carried up. It is better to get acclimated by visiting JZG the day before at 3,000 meters then do HL instead of the other way around because the altitude is really uncomfortable for those not used to it. Huanglong, or yellow dragon in Chinese, consists of a section of highly mineralized stream that flows through the length of the park. The minerals leave a yellow deposit and accumulate into pools (see photo), and forming dozens of waterfalls. The water is inhospitable to microlife, therefore the water is blue and crystal clear. I went in the summer. I heard that in winter when the dozens of waterfalls freeze, the view is spectacular and different. Holocene: The travertine in Huanglong has lasted for thousands of decades on account of the karst geologic effect. 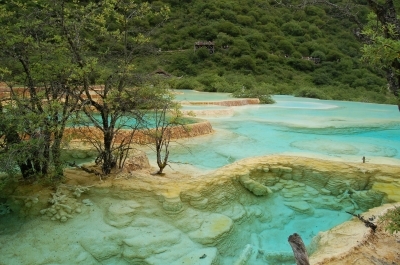 Recommended for combination by AB: With nearby Jiuzhaigou: "The Committee should relate Huanglong to the current sister nomination of Jiuzhaigou and the previously deferred site at Wanglang. lt should propose that Huanglong and Jiuzhaigou be inscribed as one site now .."